Headdresses shall be worn at all times in uniform except when eating, when in an eating establishment, or when in a place of worship. Headdress may also be removed while in transit on public transportation but must be replaced before exiting the vehicle. Cadets traveling in uniform typically are expected to keep headdress on but may remove it en route if the design of the vehicle makes its wear impractical, on extended trips or at the discretion of the senior officer present. Headdress is also customarily removed when seated in class. The wedge is the primary headdress. It shall be worn centered on the head, two finger widths above the eyebrows and tilted slightly right. 1. Short Sleeve Dress Shirt – The short sleeve dress shirt is worn during the summer with the top button open. It is also worn with the necktie under the tunic (see JACKETS) on formal occasions. It shall be kept clean and wrinkle-free. The only crease is to be down the centre of each sleeve starting at the centre of each epaulette. Rank slip-ons (see MISCELLANEOUS) shall be worn on the shirt epaulettes. The shirt shall be tucked into the pants at all times. 2. Necktie – The black necktie shall be worn with the dress shirt under the tunic on formal occasions. It shall be knotted neatly using a Windsor knot and kept tight. When tied, it will extend to the middle of the pants belt buckle. The black cadet necktie shall be worn with the blue cadet short sleeve shirt under your tunic or C1, C2 Uniform standard. It shall be knotted neatly using a Windsor knot and kept tight. When tied, it will extend to the middle of the pants belt buckle. 1. Tunic with Cloth Belt – The tunic is the formal jacket of the cadet uniform. It is worn over the sweater during the winter and is also worn over the dress shirt and necktie on all formal occasions. It shall always be fully buttoned, with the exception of the top button, and shall be kept clean and wrinkle-free. The sleeves of the jacket shall have no creases. The cloth tunic belt shall be worn so the excess of the belt (not more than 8 cm) is on the left side of the buckle. The buckle shall be centered on the uniform. Nothing is to be carried in the tunic pockets, and all pocket flaps shall be buttoned at all times. 2. Cadet Parka – The cadet Parka or All-Season Jacket may be worn year-round when weather conditions dictate. The liner and the exterior jacket may be worn separately or as a set. 1. Trousers – The trousers shall be pressed so as to have creases down the centre of each leg in the front and the back. Creases in the front shall extend from the first belt loops to the bottom of the legs. Creases in the back shall extend from the back centre belt loop to the bottom of the legs. Creases shall not be sewn or glued. Do not carry bulky items in the pockets. 2. Black Belt with Nickel Buckle – The black belt with nickel buckle shall always be worn with the cadet trousers. The buckle is to be centered with the nickel end meeting the nickel buckle with no black showing between the two. The belt length will need to be adjusted in order for this to occur. 1. Boots – Black ankle boots should be cleaned and polished on a regular basis. The whole boot is to be polished, not just the toe. The areas of the boot where the sole meets the leather are to be cleaned and blackened with an old toothbrush and black polish. Boots are to be laced horizontally from side-to-side. When the boot laces are tied, the ends of the laces are to be tucked inside the boot. (see boot care). 2. Wool Socks – Grey wool socks shall be worn with boots. If a cadet suffers from a recognized allergy to wool, the cadet may wear grey cotton or nylon socks with approval from the Supply Officer. 1. Name Tag – Your first name tag will be provided to you by the squadron free of charge. 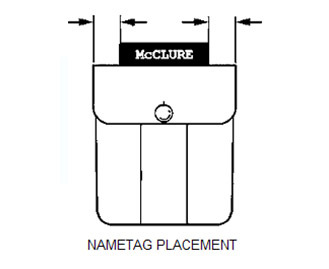 Cadets are requested to reimburse the Squadron for the cost of a replacement name tag ($5.00) if one is needed. It is worn centered over the right breast pocket of the short sleeve dress blue shirt or tunic, depending on the uniform type you are wearing. 3. Gloves and Toque – Issued black gloves and Blue Toque may be worn with the all-season jacket in cold weather. 4. Remembrance Day Poppy – The Remembrance Day poppy shall be worn on the uniform on Remembrance Day (November 11th) and for a total of two weeks prior to Remembrance Day. The poppy is worn centred on the left pocket flap of the tunic.